I remember standing on top of the Eiffel Tower and how my knees turned to jelly when I looked down. How my heart rate doubled when I was walking across the bouncing suspension bridge over the Rio Grande Gorge in New Mexico last year. One of the worst experiences was walking along the indoor balcony of Mexico City’s Fine Arts Palace, where only a small balustrade keeps people from falling down onto the ground floor. Just coming somewhat close to that balustrade caused me to nearly hyperventilate. Even being inside of high buildings is enough to make butterflies swirl around in my tummy – not the good kind though… More like thousands of annoying little ants running around my intestines. Reading this story about the floor of the glass bottom viewing boxes in Chicago’s Willis Tower cracking was enough to give me sweaty palms. 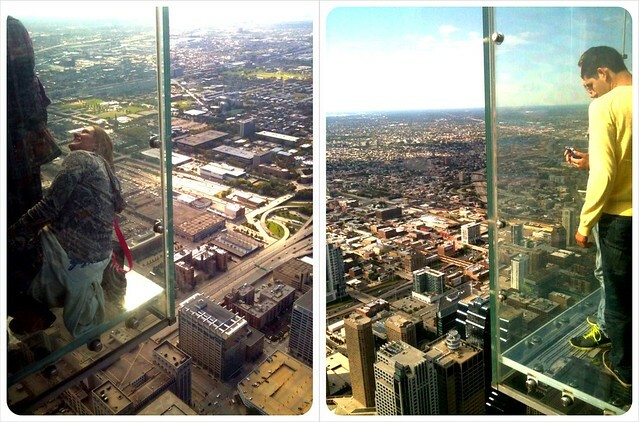 I remember how everyone was hanging out in that box the last time we went up there to enjoy the views over Chicago, seemingly careless and happy about the thrill of seeing the street right below their feet, and me just wanting to pull them all out of that damn thing, sweating heavily and my heart racing. My fear of heights is bordering on a panic of heights. The edge walk on top of Toronto’s CN Tower? My nightmare. Abseiling from the highest building in La Paz? Horror. 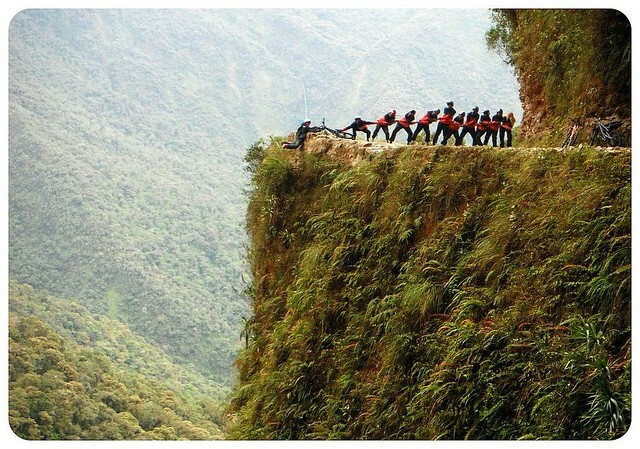 Walking on a tiny walkway hundreds of meters above an abyss? Unthinkable. And just looking at the height in these pictures of the world’s tallest rope swing make me feel like throwing up. Bungee jumping o skydiving? Only over my dead body. But then I did this recently. Don’t ask! I’ll be sharing the full story behind this photo soon. And yet, here I was, standing on the lowest step of a set of stairs that led into nothing but thin air, about to step off it, into… nothing. The ground hundreds of feet below me (apparently the height is equivalent to a 20-story building), and I was only hooked to a small metal snap hook via a thin rope that was holding my harness (and my entire body weight! ), connected to an over 2,000ft long steel rope; the end of it not even visible from our starting point. What the hell was I doing here?! Not everyone was as terrified as I was. Certainly not Rease! 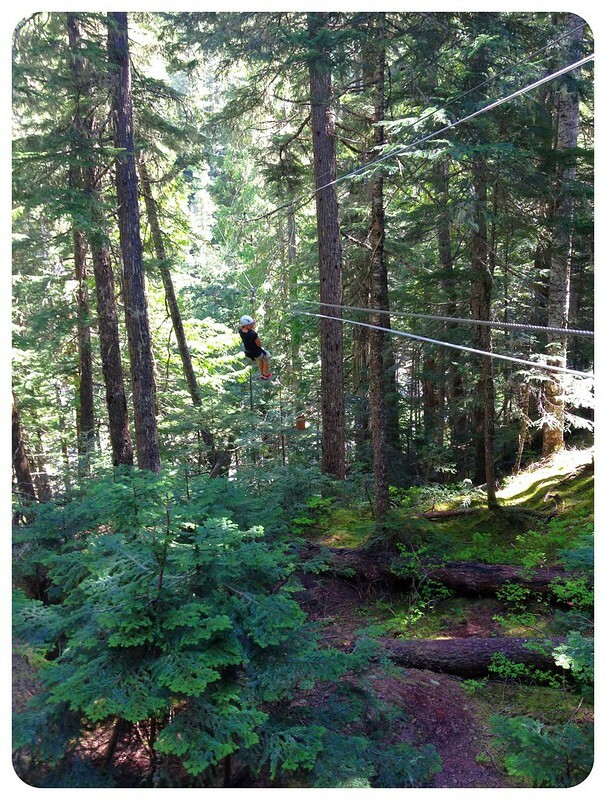 This wasn’t my first attempt at zip-lining. The first one in 2007 seemed even more pathetic now that I was about to whiz from one mountain to another with speeds up to 90kmh/55mph. Back then, Jess and I were visiting Cornwall and were invited to try out a brand new zip line off a cliff over a beach – one single short zip line, and we’d be lowered to the ground (which was much closer to the zip line than this one) after a quick 20-second ride. We were standing next to each other on the parallel steps, counting down: three, two, one… And neither of us let go. This went on for about fifteen minutes until we eventually jumped off the cliff (literally), even though we were both terrified and convinced that we were stupid for doing this. I felt sick to my bones all day after that. Fast forward seven years and here I am on a parallel zip line again, this time about to jump off a stair that leads into the air, and four more ropes like this one after that. 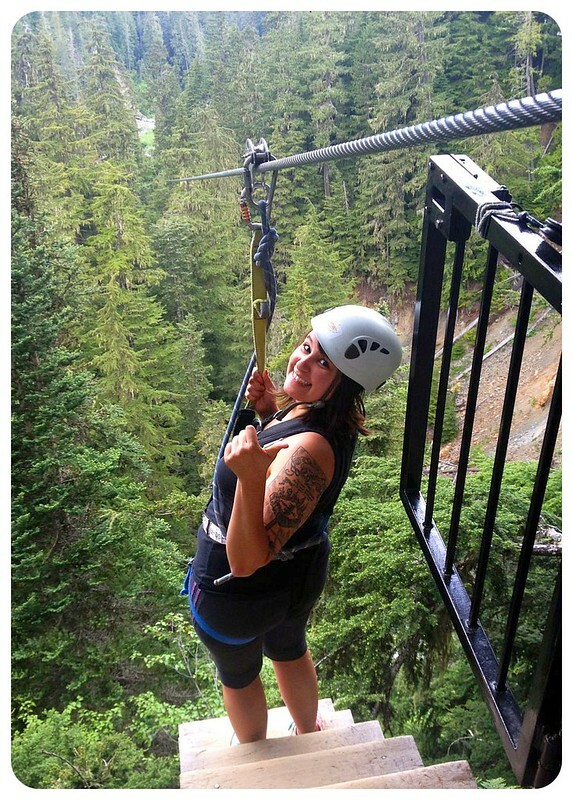 Admittedly, I wasn’t here because my idea of an awesome afternoon in Whistler involved whizzing through tree tops, but because the fab team behind the Great Coast Road Trip had arranged this activity for us two adventurous girls. And at the time, it had seemed like a splendid idea. Now that I was actually about to jump off these stairs, not so much anymore. Like, not at all. Could I possibly chicken out? When the first two people went, I felt my heart sink to my boots. 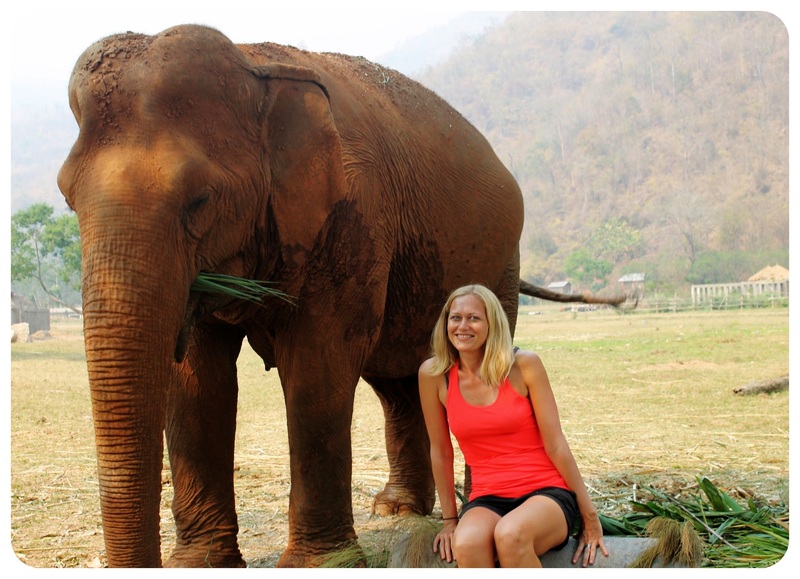 I told Rease we’d had to go soon after – I knew that if I waited too long, my fear would turn into panic and there was no way I would be able to let go once that happened. The next two people went, and we were up next. I felt like crying. Why do people do this, I thought to myself. Rease on the other hand was beyond excited and couldn’t wait to go. I had to do it. Back in Cornwall, it was just the two of us – we could have chickened out – but here was a whole group that was in search of a thrill, which meant if I would take as long as I took in England, I’d slow down (and annoy) the whole group. Three, two, one… And I let go. My heart skipped a beat as I sped off into the unknown – truly the unknown, because you couldn’t see the other side – down the line, faster and faster, the giant gap between me and the ground always right in front of my eyes. A million thoughts raced through my head, from ‘Oh my god the rope is gonna snap, I will die’ to ‘I really want to see a bear.. Is that one down there?!.. Not so fast! !’ to ‘WTF am I doing here!?’. When we, after what seemed like an eternity but in reality was probably not more than 60 seconds, finally reached the other side, I could barely feel my legs. I was so shaky that I was almost not able to walk. For a moment I thought I might pass out. All I could think was: I have to do this four more times. Instead of facing my fear only once, I had to go through this nightmare five times. This was insane! You would think it’d get easier with each time, but it didn’t. Each and every time I was convinced the rope would snap, and I would reach the other side shaking. I only wanted to make through it…. Which, in the end, I did. Was it the most horrible thing I’ve ever done? Probably not. Would I do it again? Probably not. But it also wasn’t the worst thing I’ve ever done – and I faced my fear. What’s your biggest fear? Have you faced it? Thanks to Rease for capturing my terrified face and screaming. Ah this looks awesome! I recently went rock climbing which was somewhere in-between exciting and terrifying. Good on you, Dani! Zab has a similar fear, so I can understand where you’re coming from. You do know that the glass that broke on the Chicago viewing tower was just the inner layer – not the stuff that actually supports people so no one was at danger of falling. I get it’s still scary, though! 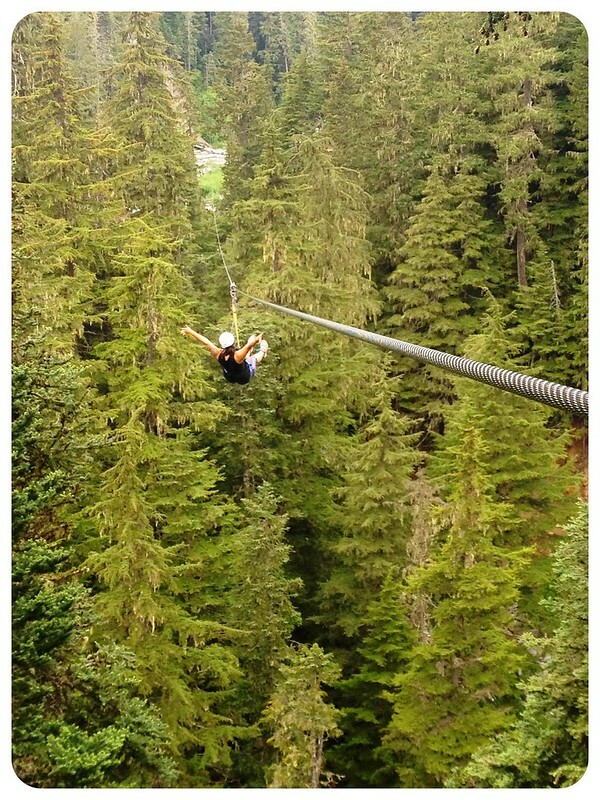 Having lived in Vancouver for many years I’ve been to beautiful Whistler a hundred times but have never done the popular zip lines. Ironically my first zip line experience was in Mexico just last year and its got me wanting to do Whistlers lines when I go home for a visit. 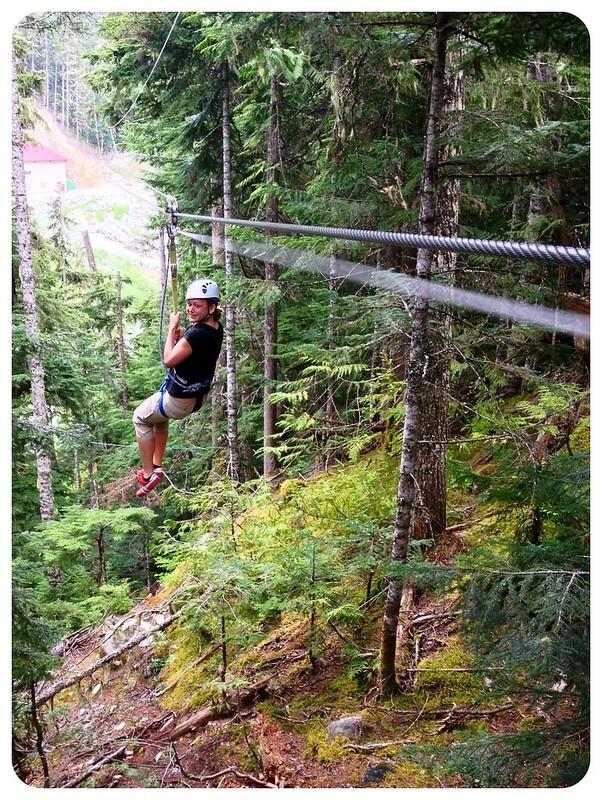 You’ll have to let me know how the Whistler ziplining trek compares to the one in Mexico, Sarah! I love your Guadalajara photos, btw – now I totally wanna go there! Unfortunately my biggest fear is flying. As my biggest love is travelling I have to face this on a regular basis and I hate it every time. I have hyperventilated before when going through particularly bad turbulence (a cyclone in New Zealand). I have to take valium for every flight I take which helps but I am still terrified, take off is the worst! 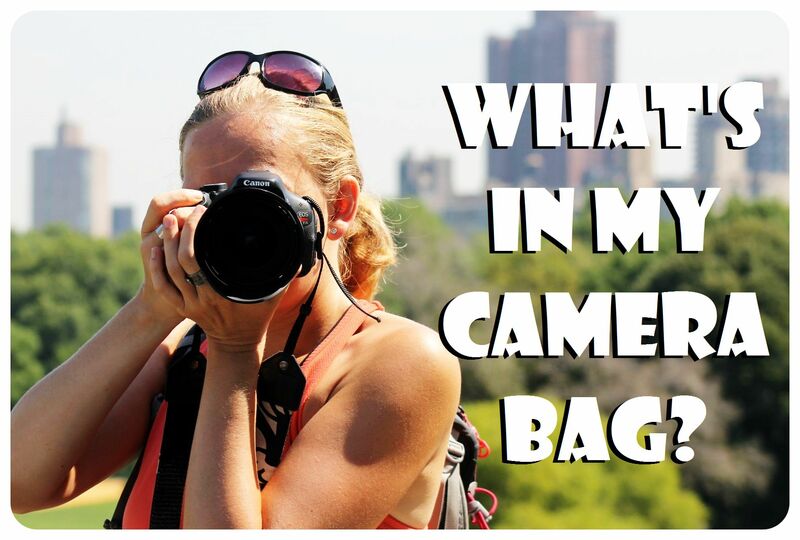 Katie – Don’t even get me started on my fear of flying!! I had an entire paragraph on it in the article at first but had to take it out because it was getting too long. I think that makes for a whole different article 😉 I had extreme turbulence once and since then I’ve been panicking even more. Now that I usually fly by myself it’s even worse than when I had someone by my side! I would absolutely, 100% freak out in this situation. I can almost guarantee that I would not have even made it to the top of the stairs. No way. Good for you for conquering your fears! I’m sure that feels good, even if the actual moment was rough.